Neighbourhood bar and brasserie with particular focus on brunch, small plates and an elegant bar. The Southside food scene goes from strength to strength, and this part of town is now packed with pleasant little neighbourhood places serving happy locals. 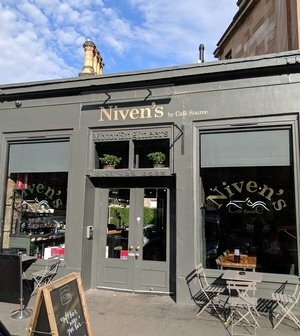 At Niven’s, though, Nithsdale Road has a food venue that makes it worth travelling to taste, with a clever, inventive small-plate menu to compete with trendy Finnieston’s finest. Backed by the Café Source brand, Niven’s might be expected to serve reliable, good-value standards, but the cooking here is of a higher and more memorable order. Cullen skink arancini come as a pair of crispy spheres of smoked fish and carbs, satisfying in their own right but lifted to another level by an intensely flavoured leek purée and light lemon-potato foam. Ox cheek and haggis pithivier is a rich, juicy assembly of meat in a delicate pastry shell, and again it’s the accessories that make it genuinely special – in this case a deeply umami turnip purée, and horseradish mash. Earlier in the day, breakfast and brunch options feature Niven’s own sourdough bread, plus exotica like Indian scrambled eggs with Bombay potatoes. Craft ales are a speciality, and there’s a fair range of gins, cocktails and wines by the glass. Casual, pub-y, kid-and-dog-friendly it may be – but Niven’s is also a serious choice for exciting dining.